German-born painter Paul “Pablo” Fischer (1864-1932) lived in Mexico for many years and painted at least two watercolors of Lake Chapala. Fischer (1864-1932) was born in Stuttgart, Germany, and earned a medical degree at the University of Munich, in 1884. He traveled to Mexico in about 1890 to administer an inheritance in the northern Mexico state of Durango. From 1890 to 1895, Fischer worked as a resident doctor in the Mina del Promontorio mine in that state. During those years he became known as Pablo Fischer. He went into private practice in the City of Durango in 1895, the same year he married a local Mexican girl Gertrudis; they had a son and two daughters. The family later moved to Lerdo and then to Torreón (Coahuila) where Paul Fischer died in 1932. Fischer painted watercolors for pleasure and was completely self-taught. Painting was clearly his passion and he made preliminary sketches for his paintings during the family’s vacation trips in various parts of Mexico. He rarely dated his paintings, but Fischer is known to have painted scenes not only of Durango, but also of Mexico City, Cuernavaca, Cuautla (dated 1897), Puebla, Oaxaca, and Chapala. 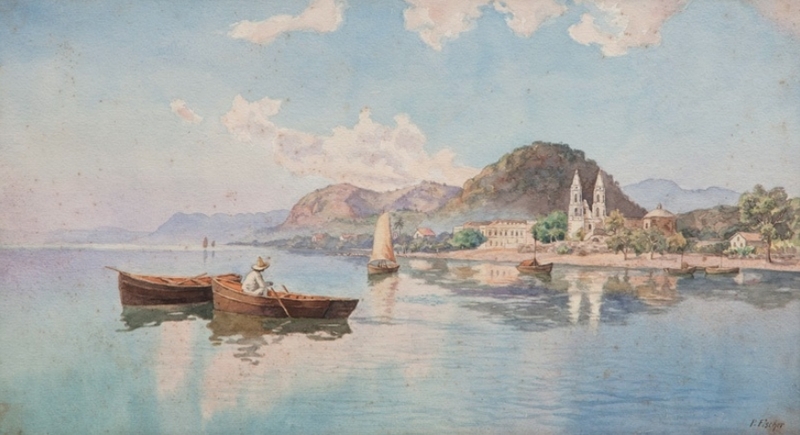 Pablo Fischer’s second view of Chapala is from a boat on the lake, looking back towards the town of Chapala, the church, and the Hotel Arzapalo. Since the Hotel Arzapalo is shown as complete (with its second story), we know that this painting was completed after 1898, the year the hotel opened. Fischer’s landscapes are keenly observed and painstakingly executed, with exquisite details and a wonderful grasp of color. Fischer signed most of his paintings simply “PF” though on occasion he used “P. Fischer”. 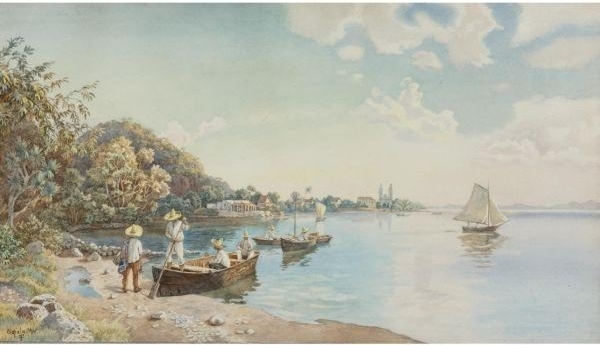 He often gave his paintings as gifts, and there appears to be little evidence that he sold any of his works, but his outstanding watercolors became quite well known. So far as is known, the artist never held an exhibition of his works in Mexico, but did hold at least one showing of his paintings in El Paso, Texas. One of Fischer’s paintings forms part of the SURA (formerly ING) collection in Mexico. This painting was included in a touring exhibition entitled “Horizontes. Pasión por el paisaje”, shown in Guadalajara and several other cities, from 2005 to 2010. The biography of Fischer attached to the SURA collection in Mexico says that the artist held his first exhibition in El Paso in 1910, though the precise location is not given. Certainly, however, in April 1926, an exhibition of Fischer’s work was held in the Woman’s Club of El Paso. Over the years, the El Paso Museum of Art in El Paso, Texas, has amassed a significant collection of his works. The Museum hosted a showing, with catalog, in September-October 1963, entitled: An Exhibition of Watercolors by Pablo Fischer, 1864-1932. Several members of the artist’s family attended the opening reception. Prior to the exhibition, the museum asked local residents for the loan of any Pablo Fischer paintings in their possession, since “The painter was very popular in this area about 50 years ago.” It is believed that some of his paintings were brought to the El Paso area by his son. Painting must run in the family since two direct descendents – Lilia Fischer-Ruiz, who paints under the pseudonym Rhiux A. and her daughter Liliana – have also both become successful professional artists. I am happy to read some of my greatgrandfather´s history and information, most of the information I provided a while back to the curator of the ING collection for the exhibit Horizontes, because their information about my greatgrandfather was incorrect. I appreciate the article, there is only one mistake on the spelling on Fischer at the end of the story. Thanks, it is refreshing to see updated information on Pablo Fischer. I loved your article about Pablo Fischer, and – since you mention my name – I would like to receive a copy. Thanks so much, Rhix.a. Today I discovered Sombreror Books as I was searching information about P. Fischer. My brother owns an original watercolor of this painter and I have one signed only F. Mexico and another one without any signature. Could these be also by Paul (Pablo) Fischer (all without dates)? My Grandfather (born 1879) spent several years in Mexico and returned to Germany in 1910 bringing back paintings by August Lohr (oil an watercolours) and Paul Fischer. Both painters are very little known in Germany and nobody is able to say anything about the value and interest of those paintings. It certainly sounds possible that the two paintings are indeed by Paul (“Pablo”) Fischer. You mention that your grandfather was in Mexico for several years. Do you know much about his travels in the country or his activities during his time there? You probably already realize that we have a short bio of August Löhr (1843-1919) at http://sombrerobooks.com/?p=778. We are unable to say anything about value of paintings, but they certainly are by great painters who both have considerable historical interest. Hola Luis Verduzco, efectivamente mi abuelo paterno es José Fischer y soy hija de Eduardo Fischer Moye (que ya murió) y Lilia Rosa Ruiz Arriaga. Mi madre es artista plástico y yo también, con obra muy distinta a la del bisabuelo. Tienes información o historias del bisabuelo? Me encantaría escucharlas leerlas. Mi correo es lilianafischer@hotmail.com a tus órdenes.